This movement is pushing for an "unregulated live experiment on children." Would you raise your hand? Almost half of them did. The truth? I gauge it off my book Critical Conversations: A Christian Parents’ Guide to Discussing Homosexuality With Teens, which I sent off to final editing and production right after the Obergefell gay marriage decision in June, 2015. I said almost nothing about the transgenderism in it — because the transgender movement was hardly in view at that time. I’d just missed it, in fact. Bruce/Caitlyn Jenner’s July 2015Vanity Fair cover story had just come out. That was the moment the transgender movement took off. Obviously it had been getting a bit of a boost by being the “T” in “LGBT.” But Jenner’s magazine cover gave the movement rocket-launch momentum. That was less than four years ago. The first real public controversy over “transgender rights” came with North Carolina’s bathroom bill, which started making news in March 2016 — barely more than three years ago. Did you think it had been longer than that? Don’t feel bad. It sure seems like longer. The trans movement has done way more than ten years’ worth of damage. News from Great Britain today underscores that. 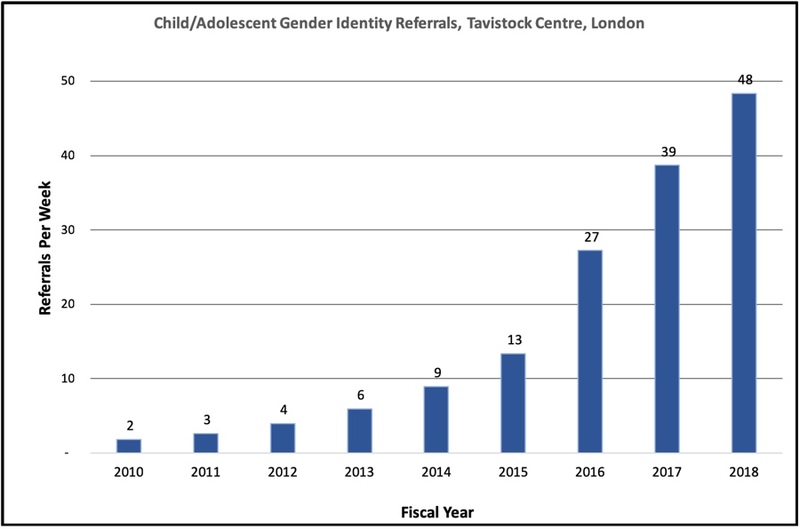 The Tavistock Centre in London is the United Kingdom’s one publicly funded clinic treating transgender children and adolescents. Five clinicians have just resigned from there “over concerns children were being incorrectly diagnosed with gender dysphoria,” according to the Daily Mail. Let that sink in. Don’t rush past it. This movement is pushing for an unregulated live experiment on children. This is evil. And it’s growing. Fast. For years the Tavistock Centre received about 50 transgender referrals a year. Last year it got about that many per week. Referrals Per Week, Tavistock Center, London. Data sources. The actual total in the 2017-2018 reporting year was 2,519 children referred for treatment. How many of them were really struggling with authentic gender identity problems? How many were experiencing another, unrelated point of pain in their lives, and thought they might find relief in becoming someone else? Or, how many were “transtrenders,” simply following a crowd? How many saw it as cool path to anti-adult rebellion? And how wise is it for adults to administer medicine and perform surgeries locking young people into immature confusions and youthful fads? Could there be anything more foolish than that? Anything? Yes, there could be. Run the numbers, and you’ll find it’s even more insane than you likely realized. That would mean about 500 children having the real struggle — ten times as many as the pre-2010 years. That seems like a generous estimate to me. Past statistics would suggest that 15 percent of that group, or about 70 to 80 children, are headed toward a difficult lifelong problem with gender dysphoria. Which ones? It’s hard to tell in the short run. So treating any child with hormones and/or surgery for gender issues is unwise — even if you believe that treatment helps. But remember: If only 70 to 80 of those 2,519 children are heading toward lifelong gender confusion, issues, then more than 2,440 — 97 percent of them! — need no treatment at all except care, counseling and time. And that’s if you agree with the more extreme “treatments” in the first place! And this isn’t only about the United Kingdom. Across the Western world, thousands upon thousands of children are being given hormones, with irreversible yet still unknown effects, and even surgery, in support of this raging, exploding transgender movement. Can you think back four years? What were you doing then? That’s how long it’s been since all this was unthinkable to everyone — all except the few radicals who pushed it on us. 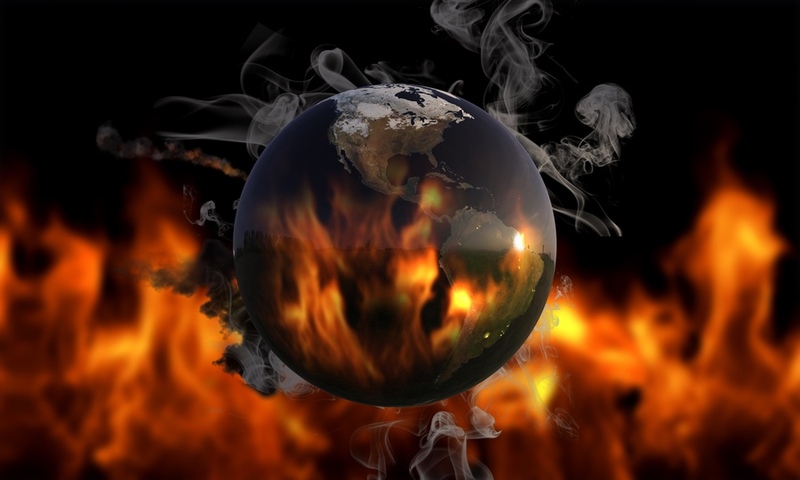 The world has never seen any movement so obviously damaging, so plainly irrational and so evil gain so much power so quickly. I’ll be honest: Sometimes I tire of talking about transgenderism. I really prefer writing about positive things. And why should we even need to talk about it? It hadn’t ought to need so much attention; its faults should be obvious. To everyone. Yet this is the way it is. The world has never seen any movement so obviously damaging, so plainly irrational and so evil gain so much power so quickly. That means we dare not tire of standing for what is right, true and good. None of us can afford to tire of it. This movement has unbelievable, humanly unparalleled momentum behind it. Someone’s got to lead in turning it around. You and I have got to be those someones.